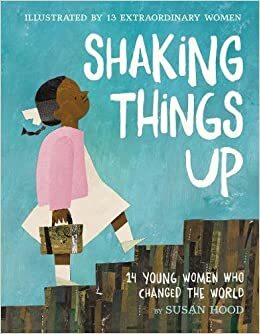 Summary: 13 poems honor 14 girls and women (sisters Jacqueline and Eileen Nearne, secret agents during World War II, share a poem), with art for each one from a different children’s book illustrator. Some of the subjects are better known (Frida Kahlo, Malala Yousafzai) than others (Annette Kellerman, Angela Zhang). Their fields range from art to science to sports, and each one is in a different form of poetry. A brief biographical paragraph accompanies each poem, and a timeline at the beginning shows where each woman fits into history, from the early 1780’s to 2014. Sources and additional resources are listed for each woman at the end. 40 pages; grades K-5. Pros: Readers will be inspired to learn more about these girls and women, many of whom were well on their way to success in their teens. The variety of illustrations celebrates women artists as well. Cons: I was occasionally frustrated by only having a little information about someone I would have liked to learn about in greater depth.